42 MAIN STREET/CHURCH STREET CORNER. 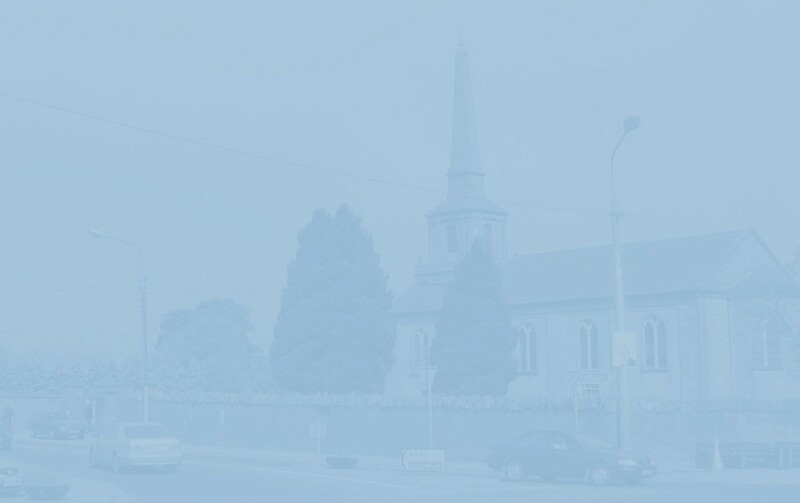 This picture was taken in 2012 after Rollestons Solicitors had moved to Wesley Terrace. 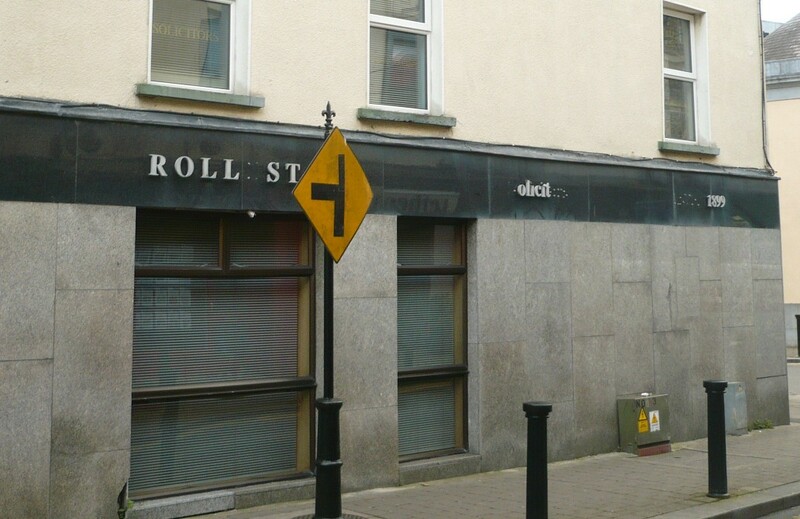 The building was refurbished in 2013 and, after lying vacant for some time, the name Gerald Meagher & Co. Solicitors appeared over the door in March 2014. But the premises remained vacant and, in June 2015, a For Lease sign went up there. In December 2017, advertisements for DNG Kelly estate agents appeared in the windows. [See also next page]. For much of the 19th century, the Pilsworth family was prominent in the town. As far back as 1817, for instance, a William Pilsworth was Inspector of Maryborough Gaol. In February of the following year, he wrote to the Chief Secretary’s Office in Dublin Castle, requesting the immediate removal of a lunatic prisoner to Richmond Asylum because "the noise this poor man makes may put the Gaoler off his guard". On a happier note, he also reported that the gaol was "completely rid of the Typhus Fever that existed in it". In 1824, a William Pilsworth was an apothecary; in 1837 his namesake was Postmaster and, in 1851, an X. Pilsworth was Treasurer of the local Masonic Lodge. I have been unable to establish the family connections between these men, but what I am sure of is that, from the 1830's until his death in 1871, the occupier of the house, offices, yard and garden on this site was the apothecary and druggist, Thomas Pilsworth. In March 1872, the new occupant, John Hipwell1 placed an ad in The Irish Times offering for sale "the shop fittings of the late Dr Pilsworth, consisting a large nest of drawers with brass name plates attached, and a quantity of stoppered and covered stock and show bottles". Hipwell's was a Grocery, Ironmongery, and Garden & Farm Seed Warehouse (1890: These seeds have been selected with the greatest care, but no warranty, express or implied, is given...) and, well into living memory, one of the town's great landmarks. As well as being the store that does all things well, the business was an agency for such well-known shipping lines as Cunard and White Star. I wonder how many emigrants from the town booked their farewell passage here? In happier times, you could book your week in Butlins Holiday Camp in Mosney and, if you wanted to venture further afield, Hipwell's would also look after your travel arrangements with Aer Lingus, TWA and other airlines. On a more down to earth level, the shop operated a pink paraffin delivery service. Pink Paraffin (Kerosene) was once a very common fuel for home lighting and heating. Although the Hipwell name was retained, the business was in later years run by the Hinds family, and thereby hangs not just a tale, but a Boy's Own adventure story.... Valentine Griffith 'Griff' Hinds was born in Money - sometimes written Munny - Cross between Maryborough and Timahoe in 1872. Shortly after starting work - aged 13 - as a shop-boy in Hipwell's, he left and took off for Belfast. After some years there, he returned to manage a shop in Rathdowney but wanderlust was clearly in his blood so, in the hope of being sent to the war in South Africa, off he went to join the Army. The story goes that he was rejected because he refused to have some of his teeth extracted, so he travelled to Canada and worked at everything from fruit-picking to fixing bicycles before coming back to Maryborough, where, in February 1909, he married Sarah Elizabeth Jessop. He eventually bought the business he started out in. As well as being Chairman of the Town Commission for many years, Griff Hinds was involved in numerous civic, commercial and sporting activities. One of the town's most prominent and respected figures, he died in January 1973 in his one-hundreth-and-first year and is interred in St Peter's Churchyard in the Market Square. His son George succeeded him in Hipwell's. 1 It was his wife, Annie, who wielded an inscribed trowel at the laying of the foundation stone of the new Methodist Church (near the Railway Station) in May 1883. Four years later, incidentally, a tree was planted in the church grounds to honour the Golden Jubilee of Queen Victoria's reign. It - the tall one nearest the Dead Wall - is still there today.